Argo Medical Technologies just unveiled a new generation of the ReWalk exoskeleton, a device that enables people with spinal cord injuries to sit, stand and walk. The ReWalk Rehabilitation 2.0 is a redesigned model that features an improved learning interface specially designed to support beginner users and is resizable in order to fit a broader range of patients. The ReWalk suit features a patented technology with motorized legs that power knee and hip movement. The system incorporates an on-board computer with motion sensors that allow for self-initiated movement that looks and feels natural. The system operates through subtle changes in center of gravity and controls movement by mimicking natural walking speed. The new model has a size adjustment mechanism which fits users between 160cm-190cm in height. 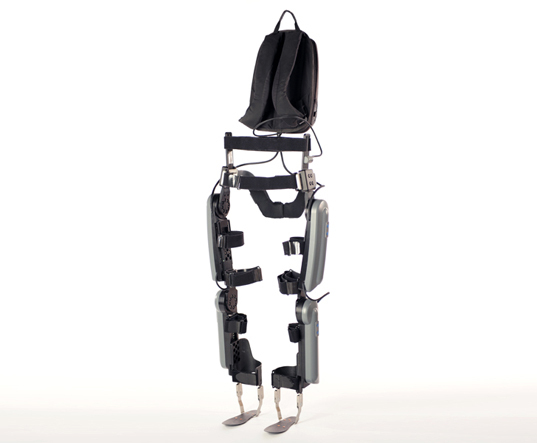 Beginners are enabled to get used to the suit more quickly by choosing the Beginner Gait Mode which significantly improves the learning curve and allows for a more independent use of the exoskeleton. The ReWalk exoskeletons are currently available as two models- the ReWalk Rehabilitation, which is available in the United States, Israel and Europe, and the ReWalk Personal, launched in 2012, which is pending FDA review in the United States. hi i need one of this for my friend in india.can you suggest me a way to get it imported. What about children born with sacral agenises? Will they benefit from this suit and at more or less what age or length?